If you're looking for the ultimate in pampering and indulgence, the La Prairie at the Ritz-Carlton Spa in NYC is for you. 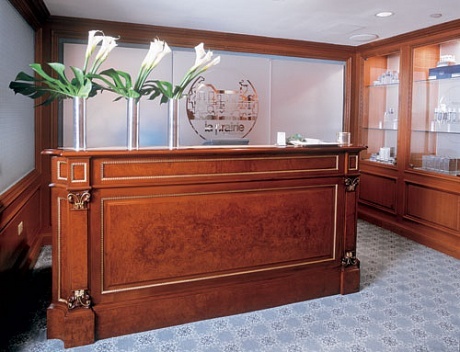 The oasis in midtown Manhattan is home to one of the finest spas I've ever had the privilege of visiting. There's just something about the Ritz-Carlton, isn't there? The name is synonymous with luxury. So it's really no wonder that the spa at this beautiful hotel is none other than La Prairie. I had been wanting to visit the spa for ages, really -- and I was simply thrilled when the opportunity recently presented itself. 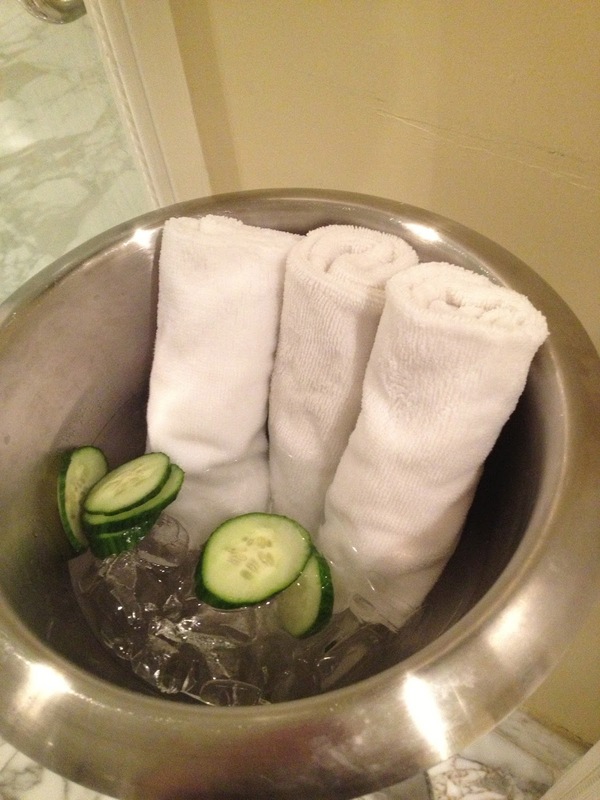 Cucumber soaked towels in the lounge. They're just as refreshing as they look! From the moment I stepped off the elevator, I was treated like a queen. Everyone working at the spa was friendly and highly professional. After being escorted to the changing area -- a sleek, chic white and silver space complete with armchairs, multiple vanities, showers and more products than you could even imagine -- I took a seat in the lounge. The lounge is among my favorites in Manhattan -- fruit-flavored water (grapefruit on the day I was there) sits alongside dried fruit, nuts and comfortable overstuffed chairs that just invite you to relax and drift off into oblivion. The treatment rooms are set off of the lounge and are quite large, so you don't feel claustrophobic in any way. Part of the lounge area. I love the tiled floor and the mirrored vanity. 4) An intensive lifting treatment on the face and neck with Skin Caviar Liquid Lift and Extrait of Skin Caviar Firming Complex followed by a gentle eye massage with Essence of Skin Caviar Eye Complex. This part of the treatment included a mind-numbing face massage that, I swear, I could have been content having done to me for the rest of my life. 7) The piece de resistance: facial toning and stimulation with patented NuFACE microcurrent technology. I had been curious about the NuFACE for quite some time, so I was definitely excited to try it in this treatment. 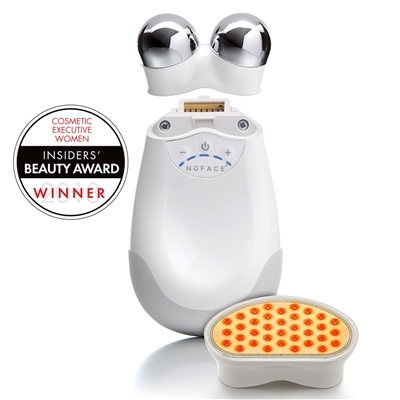 This device works to tone, tighten and firm the skin and prevent aging. As it's run over the skin, producing a low-level current that works to drive production of collagen and elastin in the skin, it provides a pleasant buzzing sensation -- it's not painful or uncomfortable in the slightest. It's common to taste metal while this is happening, though I actually did not. The NuFACE device. I promise, it's not scary at all! At the end of the treatment, my skin was fresh and hydrated, the mild breakouts I'd been experiencing were eradicated, and I looked at least five years younger. But, most importantly? I felt relaxed, rejuvenated and SPECIAL. 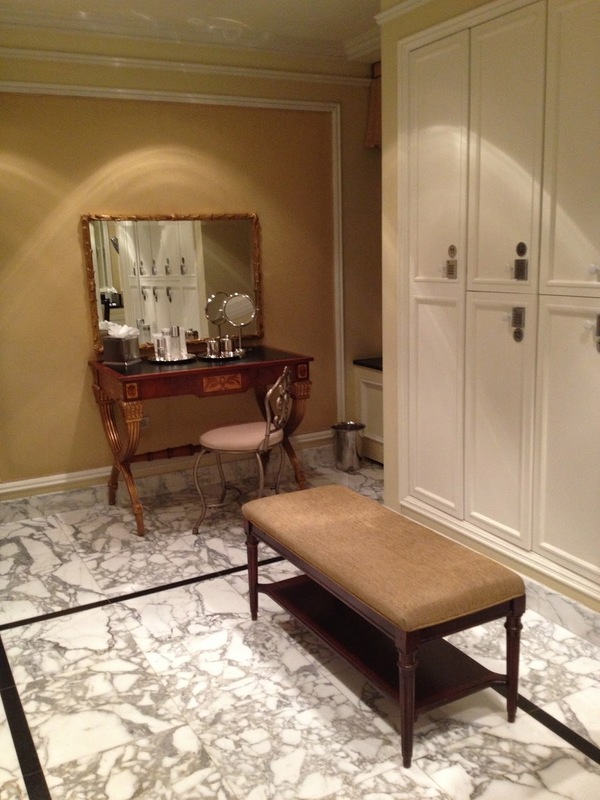 From start to finish, my experience at the La Prairie at the Ritz-Carlton Spa was spectacular. I highly recommend you let yourself indulge. For more information about the La Prairie at the Ritz-Carlton Spa and to book an appointment, visit ritzcarlton.com.